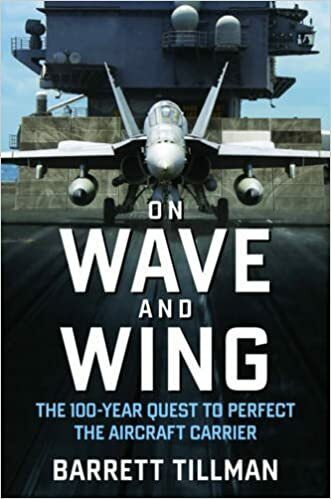 The following article on the Battle of Midway is an excerpt from Barrett Tillman’s book On Wave and Wing: The 100 Year Quest to Perfect the Aircraft Carrier. It is available to order now at Amazon and Barnes & Noble. The Battle of Midway was a decisive blow to Japan’s naval supremacy in the Pacific Theatre of World War II. 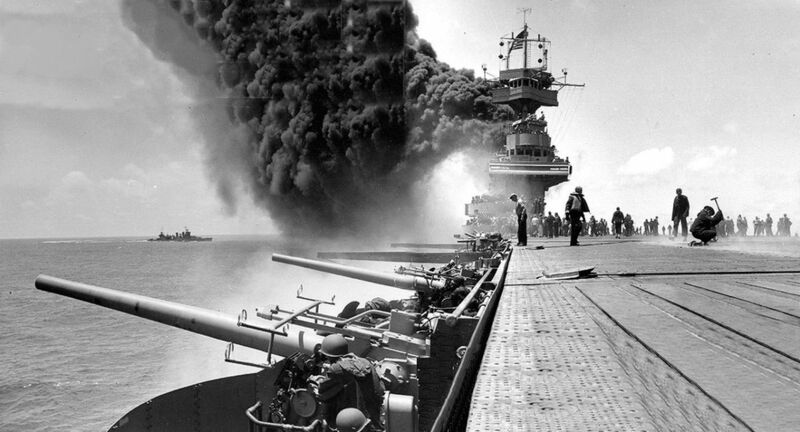 Between June 4-7, 1942, the United States Navy struck a blow to Japan’s fleet that was irreparable. In April 1942, a month before the Battle of the Coral Sea, Admiral Yamamoto had convinced the naval general staff to launch Operation MI, the seizure of Midway Island 1,300 miles northwest of Oahu. Though prudence would have dictated waiting until Fifth Carrier Division with Shokaku and Zuikaku could join the four ships of CarDivs One and Two, Yamamoto was in a hurry. He wanted to destroy the Pacific Fleet’s remaining flattops before America’s enormous industrial power came to bear. His self-allotted six-month timetable after the Pearl Harbor triumph was ticking away. The Japanese knew that the Americans had to defend Midway, thus forcing the Imperial Navy’s doctrinal decisive battle. The concept of “a Pacific Jutland” appealed to Tokyo—a titanic engagement based on the 1916 clash between the British and German fleets in the North Sea. Victorious in one conclusive battle, Japan would achieve its strategic aims. With Akagi, Kaga, Soryu, and Hiryu against an estimated two U.S. carriers, Operation MI shaped up as a near certainty, even considering land-based aircraft on Midway. To a large extent, the Battle of Midway was won before the first aircraft launched. Admiral Nimitz’s gifted cryptanalysts gleaned the basics and many details of Yamamoto’s plan, allowing the PacFleet commander to deploy his forces accordingly. Enterprise and Hornet in Task Force Sixteen returned to Pearl Harbor, while Yorktown with Task Force Seventeen limped home with its Coral Sea bomb damage. In merely three days “Old Yorky” was sufficiently repaired for sea, her weary air group largely replaced by Saratoga’s, as “Sara” remained on the West Coast. Nimitz knew that Vice Admiral Chuichi Nagumo’s carriers would approach Midway on June 4, part of a larger scheme involving the invasion force and supporting units, plus submarines. Task Forces Sixteen and Seventeen waited northeast of Midway, aided by longrange Consolidated PBYs from the atoll itself. The senior American was Rear Admiral Frank Jack Fletcher, who had ridden Yorktown since early in the year. A non-aviator, he benefited from an excellent staff. Vice Admiral William Halsey was beached with illness, replaced by Rear Admiral Raymond Spruance, whose cruisers had screened Enterprise for months. With overwhelming surface strength—eleven battleships and sixteen cruisers—Yamamoto was confident of crushing the defenders if it came to a gun battle. He did not know that Nimitz deployed 232 carrier aircraft and 115 ashore, thus outnumbering Kido Butai’s embarked squadrons—though the Japanese enjoyed a qualitative edge. Early on June 4 Nagumo launched 108 planes against Midway, which detected the inbound threat by radar. Marine Corps fighters scrambled to intercept but were badly mauled by combat-experienced pilots flying superior aircraft. Of twenty-five Brewster F2As and Grumman F4Fs, sixteen were shot down with most of the pilots killed. The Japanese lost eleven planes while bombing Midway’s facilities. The defenders responded when Nagumo’s location was reported by PBY patrol planes. Between 7:10 and 8:20 a.m., Midway-based Army B-26s and B-17s, Navy TBFs, and Marine SBDs and SB2Us attacked Kido Butai. Faced with Zeros and flak, eighteen Marauders, Avengers, and scout bombers were downed without inflicting damage upon the enemy. After an hour’s respite the Japanese faced three carrier-based torpedo attacks. Hornet’s VT-8 attacked at 9:20, losing all fifteen Devastators. Enterprise’s VT-6 lost ten of fourteen an hour later, shortly followed by Yorktown’s VT-3. Two of the latter escaped but ditched en route home. That morning ended the Devastator’s career, with four surviving of forty-one launched. Combined with VT-8’s detachment ashore, which lost five of six Avengers, the “torpeckers” sustained an 89 percent attrition. That night three air groups of proud and tired U.S. aviators reflected on what they had lost and won. Then their pride turned to incredulity. Admiral Spruance withdrew, following orders to defend Midway rather than pursue a beaten enemy. His prudence was warranted, as a nocturnal surface fight with Japanese battleships and cruisers would only have gone one way. June 5 passed largely without action as the Americans tried to sort out confusing patrol plane reports, and Spruance pondered his options. Finally, late that afternoon Task Force Sixteen launched fifty-eight scout bombers against a phantom carrier and found nothing. On the return leg thirty-two of the SBDs had a go at the destroyer Tanikaze. Having evaded two B-17 attacks already, she escaped damage again while downing an SBD. The other Douglases reached their flight decks, logging the first night combat “traps” in U.S. carrier history. The third day of the battle, June 6, dawned with another opportunity for Task Force Sixteen. During the night two Japanese cruisers, Mogami and Mikuma, had collided en route to shell Midway. They reversed course, vainly trying to get out of air range, but were spotted by scouting SBDs. From barely one hundred miles range, Enterprise and Hornet sent off three powerful strikes totaling eighty-one Dauntlesses, the last three Devastators, and twenty-eight unnecessary Wildcats. In successive attacks Mogami was battered with five bombs but survived. Mikuma took hits that ignited secondary explosions—fatal damage to the 13,600-ton warship. Two attentive destroyers also were lightly damaged. But the Imperial Navy was nothing if not persistent. That afternoon, nearly four hundred miles north-northeast of Mikuma, the submarine I-168 penetrated the destroyer screen circling the crippled Yorktown and fired four torpedoes. One ripped apart the destroyer Hammann (DD-412) lashed alongside to support salvage efforts. Two more torpedoes smashed into “Yorky’s” tortured hull, inflicting a death blow. She lingered until dawn the next morning when she capsized and sank. I-168’s attack killed some eighty men, though she succumbed to an American submarine a year later. The Battle of Midway was over. Yorktown’s loss hurt Nimitz; she was the most experienced American carrier, arguably with the finest staff afloat. But her sister Enterprise more than met the challenge and would prove essential to the Pacific Fleet in months to come. 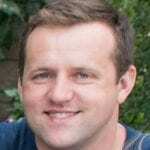 The weak link in the American team was Hornet. Captain Marc Mitscher, a well-regarded early aviator, proved lacking as a carrier captain. In fairness, he lost much-needed training time during the Doolittle operation, but he relied on unqualified subordinates, and he made some poor decisions, such as launching his short-ranged fighters first. Under a new skipper the ship did far better in the time remaining to her. Additionally, the Battle of Midway removed all doubt that the aircraft carrier had supplanted the battleship as the dominant player on the world’s oceans. This article on the Battle of Midway is an excerpt from Barrett Tillman’s book On Wave and Wing: The 100 Year Quest to Perfect the Aircraft Carrier. It is available to order now at Amazon and Barnes & Noble.